The Idaho Department of Labor (IDL) administers unemployment insurance benefits that provides assistance to workers in the state who have become unemployed through no fault of their own. Unemployment insurance benefits are funded through a tax on employers, and workers do not pay any part of the cost to provide benefits for this program. To qualify, workers must meet all eligibility requirements, including earning enough wages in their qualifying benefit period, be ready, willing and able to go back to work, and actively seeking work, among other conditions. Here’s a quick overview of how the unemployment insurance process works in Idaho. Make sure you meet all benefit requirements before you apply. Some of these include becoming unemployed through no fault of your own, earning enough wages during your Base Period or Alternate Base Period, and being ready, willing and able to look for full-time work. Determine the amount and duration of your benefit. Your benefits are generally determined by the amount of wages you earn during your base period. You will be mailed a monetary determination letter that you need to verify as correct. Conduct an ongoing job search. You are required to look for full-time work and document your efforts. The IDL may request your work search records at any time so that they can verify your employer contacts. You may file an appeal if you are denied benefits. If you file an unemployment benefits claim and you are denied benefits by the IDL, you have the right to appeal that decision. You have three levels of appeal that you can follow up to and including presenting your case to the Idaho Supreme Court. To qualify for unemployment insurance benefits in Idaho, you must meet all eligibility requirements. You must be available and able to work. To qualify for benefits, you must be physically able to work full-time. This means you cannot have childcare or transportation issues, suffering from an illness or an injury or have any kind of disqualifying physical or mental condition. In addition, you cannot have undue restrictions on the hours you are wiling to work or the types of jobs you will accept. Limiting shifts, days or distance you will travel to work can make you ineligible. You must actively seek work. You are required to conduct an active job search for each week you claim benefits. You must try to find full-time work each week in accordance with the work-seeking requirements you received when you filed your claim. Actively seeking work means you must personally contact employers who hire people with your job skills. If you cannot find your normal kind of work, you must expand your work search efforts. As your period of unemployment lengthens you may be required to look for another kind of work, accept a lower pay or search in other locations for a job. Keep records of your job search activities. You must document your work search efforts. This must include the employer name, address, phone number, person contacted, date of contact and the results of the job contact. As part of claiming benefits, you may be asked to provide those records which will be verified by IDL officials. If the IDL offers you a job referral to suitable work, you may be denied benefits if you refuse to accept the referral or do not make contact with the employer. You must be out of work through no fault of your own. This means you may have been laid off due to lack of work, you quit with good cause (i.e. you were asked to perform dangerous or illegal activities), or discharged, but not due to misconduct. You must have earned enough wages during your base period to qualify for benefits. The total amount you were paid in each quarter is used to determine your benefit. Your base period is the first four of the last five completed calendar quarters before the beginning of your claim. If you do not qualify using wages in the regular base period you may qualify using the alternate base period wages, which is the last four completed quarters before the beginning of your claim. If you have enough qualifying wages, you will receive a statement that will show your weekly benefit amount and your total benefit amount. If there are any errors on the statement, you must gather supporting documents such as W-2, paystubs, etc. and as for a monetary redetermination. This applies to both overages and underages regarding your wages. Any benefits you receive based on an incorrect monetary determination are subject to repayment. If you receive any kind of wages while claiming benefits, you must report the gross earnings for the week that you earned them. IDL compares records with employer records, including payroll tax records from other states. You must continue to file weekly claims in a timely way. Not doing so could disqualify you from receiving benefits for that week. Benefits are not approved and paid retroactively. In addition to meeting all other requirements, you must also claim benefits during your first week, which is known as a Waiting Week. You will not be paid for this week, but you must file a weekly report to get credit for it. You serve only one Waiting Week per benefit year. You left your previous employer without a good cause connected to your work. This may be because you were let go for misconduct or illegal activities, such as embezzlement or stealing. You are not able to work or not available for work. You must not have any issues that will prevent you from working full-time, such as childcare or transportation problems. You are not actively seeking full-time work. You must be easy to reach for job referrals. You are unemployed due to a strike in which you are actively involved. You failed to contact the IDL after being directed to do so. You did not participate in reemployment assessments and activities as directed by the IDL. You made false statements regarding eligibility or the amount of wages you earned during your base or alternate base period. You did not IDL provide with a record of your work search when requested to do so. You are employed by an educational institution and are between terms, school years or during holiday breaks. You are an alien and are not legally permitted to work in the United States. If you worked for the federal government in the past 18 months, you will need Standard Form 8 and Standard Form 50. Other states where you have worked in the past 18 months. If you choose to have your payments made by direct deposit, you will also need to supply appropriate information for that option (bank name and address, account and routing number). Internet Continued Claims System. You can file your claim online or by coming into a Department of Labor office to use one of their computers. During your initial application, you will need to establish a PIN which you can also use to enroll in IdahoWorks. You must have a pin to access the Internet Continued Claims and Tel-A-Claims systems. Filing online is easy, fast and a convenient system that uses no paper, and you get paid once a week. No postage is involved. Tel-A-Claim. To use Tel-A-Claim, you need to use a touch-tone phone. Call Tel-A-Claim at 1 (208) 334-4700. If you live outside the Boise dialing area, call your local office and select option 7 from the automated menu. 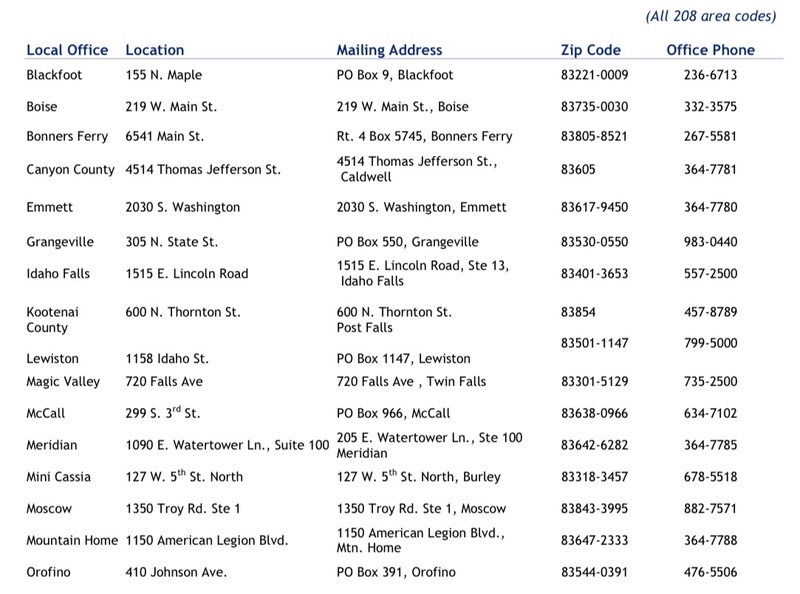 Local office numbers are listed at the end of this document. If you live in the Boise dialing area, call (208) 334-4700. TTY claimants may call Idaho Relay Service by dialing 711 and then providing the phone number to Tel-A-Claim. A benefit week begins at 12:01 a.m. on Sunday, and ends at 12:00 midnight the following Saturday. You have seven full days following the Saturday week ending date to make your call to Tel-A-Claim or to file online. If you forget to call in and file for benefits, you will need to report to your local office for information on how to process your claim. Continued Claim Report Form. If you cannot use either the online or telephone systems, you can file a claim by filling out a card by hand and either mailing it or delivering it to your local IDL office. This card usually covers a two-week period so you are paid once every two weeks. Please allow at least seven days from the date you submit your Continued Claim Report for process of any payment. To qualify for benefits in Idaho, you must have earned wages in at least two quarters of your base period. In addition, your wages during the entire base period must be at least 1.25 times your wages in the highest-paid quarter. And you must have earned at least $1,872 in the highest-paid quarter of the base period. If you meet all eligibility requirements, your weekly benefit will be your total compensation in the highest-paid quarter of the base period divided by 26. The current maximum benefit amount is $405 per week and the minimum weekly benefit is $72, which you can receive for up to 26 weeks in a benefit year. In times of higher unemployment, additional weeks of benefits may be available. It takes approximately three to four weeks to process an initial claim and for you to receive your first payment. After that, if you use the Internet Continued Claim or Tel-A-Claim system, you will be paid weekly. Assuming there are issues with your claim, your payment will be issued three to four business days from the time you submit your weekly claim. You should allow up to a week to receive your payment. If you do not receive it after that time, you need to contact your local IDL office. Payments can be issued to you two possible ways, either through direct deposit or through a debit card that is issued to you. Direct deposit is the electronic transfer of funds into the checking account of your financial institution. It is quick, safe and an easy way to receive your benefits. It saves time and removes any risk that might be caused from a delay in the mail or if your check is somehow lost in transit. Your account number and routing number are on your checks or you can contact your financial institution to verify the account information. If you decide to receive payments via a debit card, payments will automatically be deposited on the card issued to you. Your debit card can be used anywhere VISA cards are accepted. Your card will arrive about three weeks after your claim is opened. Funds are generally made available two to four business days after you file your claim for the previous week. You may review the payment summary screen at labor.idaho.gov/iw to confirm that your card has been funded. You should keep your card throughout your unemployment claim year. Your card is good for three years. For more information about debit cards, visit the IDL website or contact your local Labor office. For questions about fees, lost cards or balance inquiries, contact US Bank’s Reliacard Cardmember Services toll free at (866) 276-5114 or online. Benefits are fully taxable income. You may elect to have federal taxes withheld at the rate of 10 percent from your unemployment insurance benefits. Idaho state taxes are not withheld. You will be mailed a Form 1099-G by the end of January for the previous year. If you owe child support payments, Idaho’s Health and Welfare Department has the right, through a court order or an agreement with you, to deduct a percentage from your benefit payment. You must actively seek work while you are collecting benefits. Failure to do so could disqualify you from receiving benefits. You must look for work unless you have qualifying reasons, such as an eventual return to your old job, or you are instructed not to do so by IDL staff. As part of your job search efforts, you must keep a detailed record of your work search efforts, including names, addresses, phone numbers, date of contact and outcome for each employer. IDL staff may contact these employers to verify your work search. Falsifying work search contacts will result in a determination of fraud. If you are seeking work out of your local area, you must still keep appropriate records. If you leave town, even if you are on a temporary layoff, the primary purpose of your trip must be to look for work. You must be willing to accept a job in these other areas. You cannot be paid for any weeks that you are on vacation. In some instances, the IDL may provide you with work search contact or have you participate in a in-person interview with a Workforce Consultant from your local office. The interview is designed to help you with job search strategies that will help you return to work as quickly as possible. You may get assistance with resume preparation, interviewing skills, job market information and other related assistance. If you do not participate in this interview, your benefits will be stopped. You or a previous employer may protest any decision regarding your eligibility to receive unemployment insurance benefits. You must file a protest in writing and you will be issued a written response describing the reasons for the new decision. Determination. Using facts gathered by a local IDL office, this is the first level of decision for all cases. A protest must be delivered to your local office or be postmarked no later than 14 days after the decision is mailed. Instructions for how to appeal will be noted in the determination letter. Appeal. The Appeals Bureau in the Idaho Department of Labor central office in Boise makes this decision. The Appeals Bureau may use previously submitted information and will gather information at a hearing to render a decision. Hearings are held via telephone and if you do not participate, the judgment may end up going against you. You have 14 days from the date of mailing to file a written protest with the Idaho Industrial Commission. The protest must be taken or mailed directly to the Industrial Commission. Protests filed with the Appeals Bureau or a local office will not be accepted by the Commission. Industrial Commission. This is the first appellate stage outside the Idaho Department of Labor. Your protest to an Appeals Bureau decision must be in writing and mailed directly to the Industrial Commission. You have 42 days from the date of the decision to appeal to the Idaho Supreme Court. Idaho Supreme Court. This is the last appellate level for protesting a claims decision. Fees may be charged for filing a protest at this level. It is important to keep filing weekly claims through Tel-A-Claim while you are going through the appeals process. You will only be paid for weeks that you have filed a claim and met all requirements. If your appeal is approved, you can receive back payments for weeks that you filed claims. Base Period – The 52 week period used to determine how much your benefits will be. It is the first four of the last five completed quarters. If claimants to not meet wage requirements, there is also an Alternate Base Period that is used to assist in qualifying. It is the last four completed quarters before the claim was filed. Benefit Week – This is the seven-day period that starts on Sunday at 12:01 am and ends on Saturday. Benefit Year – The 52 week period that starts when you file an initial claim for benefits. The amount of benefits you can be paid is framed within this defined period of time. IDL – The Idaho Department of Labor is the agency that oversees unemployment insurance benefits in the state as well as providing job search and job training programs and services. Waiting Week – This is the first week of your Benefit Year. Even though you will not collect benefits for this week, you will still need to file a claim. Weekly Benefit Amount – The amount of unemployment compensation you will be paid each week. It is determined based on wages earned during your Base Period or in your Alternate Wage Period. To file a new claim, file for your weekly claim or to reopen an existing claim, go to the IDL website.